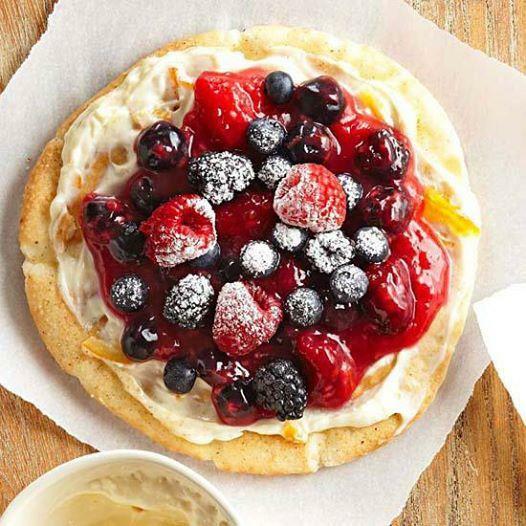 Berry Breakfast Pizza A Sweet Start To The Morning! That You Can Put Together In 25 Minutes. These beauties are truly a sweet start to the morning. is melted. Gently stir in orange peel. In a medium bowl combine cream cheese and orange marmalade; beat with an electric mixer on low to medium speed until smooth. In a small bowl stir together the 2 teaspoons granulated sugar and the cardamom. Toast the split pita rounds. Brush pita rounds with the 2 tablespoons melted butter; sprinkle with the sugar-cardamom mixture. Spread cream cheese mixture over split pita rounds. Spread berry topping over cream cheese mixture. Top with the remaining 1/2 cup berries.